Jason Read was born December 24, 1977 in Flemington and grew up in the Ringoes section of East Amwell Township. Jason became intrigued by rowing when he was 6 years old. His father bought the family a VCR and 10 bank tapes prior to the start of the 1984 Summer Olympics. The Reads attempted to record all of the action, and during that time Jason got hooked on the excitement of the boast races. As a sixth grader at the Hun School, he accompanied his older brother, Patrick, to Princeton’s rowing facility on Lake Carnegie. Patrick was a coxswain for the Hun team. A few years later, Jason was in the training tank at Princeton, working beside Olympians. Jason enrolled at Temple University and became one of the top rowers in the nation. After graduating in 2000, Jason continued to row, with an eye on breaking America’s long drought at he Olympics. Its last gold medal in the 8’s came in 1964. On the way, Jason led his team to a gold medal at the 2001 World Cup. He was named the USOC Rower of the Year and US Rowing’s 2001 Man of the Year—and was also a finalist for the Sullivan Award. When Jason wasn’t on the water, he worked with the Amwell Valley–Ringoes Rescue Squad. Squad members were among the first responders after the 9/11 attacks. Jason became Operations Chief of the squad, which later marched at the 2008 presidential inauguration. In 2003, Jason was part of the silver medal-wining team at the World Championships in Milan. 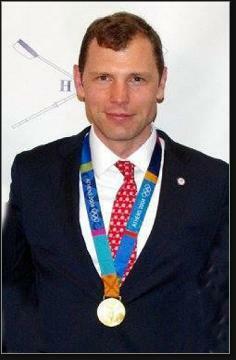 In 2004, Jason was picked for the Olympic Coxed Eight squad. The favorite in this event was Canada, which had won the last two world titles. In the opening round, the Canadian and American team both broke the old world record, with Jason and his teammates finishing first. In the final, Team USA opened an early lead and held off a late challenge by the Netherlands. The result was so decisive—and unanticipated—that the Americans broke down on the medal stand and cried. Later that year, Jason was named US Rowing’s Man of the Year for the second time, still the only man to earn this honor twice. Jason continued to row competitively through 2011. That year he was captain of the gold-winning Four team at the Pan American Games, and was a Sullivan Award finalist once again. That same year, Jason was named coach of the Princeton’s women’s crew. In 2012, he was inducted into the Temple University Hall of Fame. In addition to his coaching duties, Jason is a popular speaker at crew banquets and events.